the electrode melts to form the weld bead. The main difference is that the metal electrode is a small diameter wire fed from a spool, and a shielding gas is fed through the torch. As the wire is continuously fed, the manual process is sometimes referred to as semi-automatic welding. Short-circuiting and pulsed metal transfer are used for low current operation, while spray transfer is only used with high welding currents. In short-circuiting or 'dip' transfer, the molten metal forming on the tip of the wire is transferred by the wire dipping into the weld pool. This is achieved by setting a low voltage. Care in setting the voltage and the inductance in relation to the wire feed speed is essential to minimise spatter. Inductance is used to control the surge in current which occurs when the wire dips into the weld pool. For spray transfer, a much higher voltage is necessary to ensure that the wire does not make contact, i.e. short-circuit, with the weld pool. The molten metal at the tip of the wire transfers to the weld pool in the form of a spray of small droplets (less than the diameter of the wire). However, there is a minimum current level or threshold, below which droplets are not forcibly projected across the arc. If an open arc technique is attempted much below the threshold current level, the low arc forces are insufficient to prevent large droplets forming at the tip of the wire. These droplets transfer erratically across the arc under normal gravitational force. The pulsed mode was developed as a means of stabilising the open arc at low current levels, i.e. below the threshold level, to avoid short-circuiting and spatter. Spray type metal transfer is achieved by applying pulses of current, each pulse having sufficient force to detach a droplet. Conventional MIG/MAG welding is carried out using a constant voltage power source which provides an inherently stable 'self adjusting' arc. For pulsed welding, either a constant voltage or constant current power source with voltage feedback is used. The only difference between MIG and MAG is the type of shielding gas used. Typical inert gases are argon and helium. Typical active gases are mixtures of argon, carbon dioxide and oxygen. 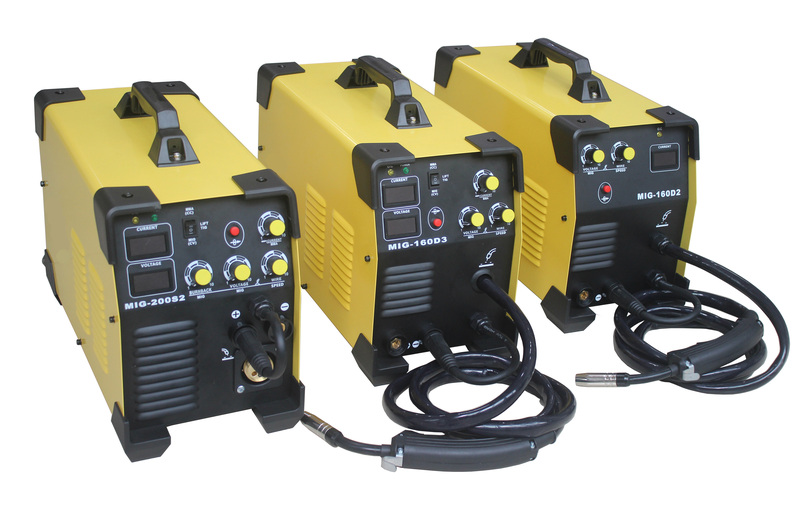 Here're some related MIG/MAG welding machines products!